Looks like you’ll be able to get some “Dutch Love” at Fifth Third Ballpark this summer. The flatbread sandwich has been named the winner of the 2016 Fan Food Vote. 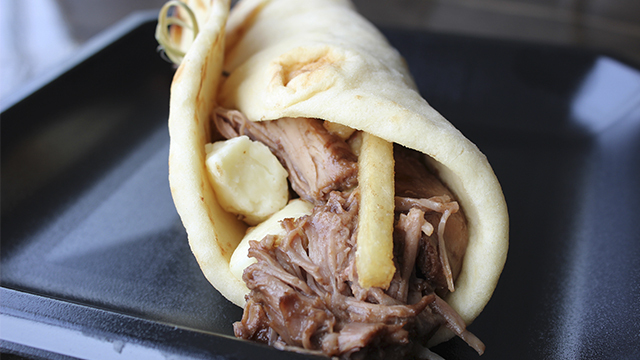 The sandwich features turkey pot roast, gravy, cheese curds and French fries wrapped up in a pita. Dutch Love can be purchased at the Comfort Food Cart located on the concourse behind home plate. Your first chance to try the newest menu addition will be at the Whitecaps‘ home opener Saturday, April 9. The Whitecaps will be taking on the South Bend Cubs at 4 pm. Tickets can be purchased by phone to 616-784-4131, online at www.whitecapsbaseball.com, or in person from 10 a.m. to 5 p.m. Monday through Friday at the Fifth Third Ballpark Box Office.